Gurung, who admitted that he was being "blunt" said: "Political parties should have the guts, courage to tell the people that your dream of statehood, cannot be achieved so early. For statehood, there should either be political compulsion or political will (of the power in Centre)." Gurung, who heads the NGC, was speaking his mind and not the stand of NGC, at a consultative meeting with local stakeholders at Gorkha Dukha Niwarak Sammelan Hall in Darjeeling on Wednesday. During the interaction, Gurung said: "Since there is no political will or political compulsion, statehood is a little far. This is the reality. Political parties should not think that if we tell that statehood is a little far, little difficult, our votes will be less. You have to be very honest ....if statehood is not possible immediately, what is possible, you have to tell the people." "My request to the political parties, is let us be very open with the people and tell them; look, statehood is our final issue, let's try this way and that way and the struggle must go on it should not finish," he went on. 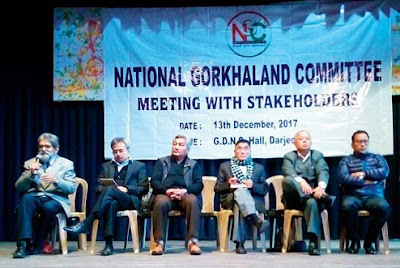 Given the sensitive statement made by Gurung, who is the president of the NGC, Munish Tamang, the general secretary of the body immediately, took the mike and clarified the armyman's statement. "The NGC is not trying to say that statehood is very far. What we are trying to say is that even now, people talk whether statehood is good for the moment or Union Territory. Many people have different stands. Through a series of consultations, if political parties feel that is the scene (now), then, it should be spelled out clearly," said Tamang.